Kids in their early teens are too old for fairy cakes, jelly animals and jam sandwiches. So how do you make party food they'll like? The best way to ensure that everyone's satisfied is to encourage them to give a hand with the food preparation. That way they can tailor the food to their own likes and dislikes and everyone's happy - including the host! With a hamburger as the focal point, all you need is bowls of chips along with some salad and pasta. This will ensure a filling and nutritious meal teens will love. This recipe will make 8 burgers i.e. 1/4lb of meat per person. Prepare the hamburger patties by mixing together the mince with onion and salt. when the mixture has cooled split it into 8 balls and then mould into a burger shape. Place under a medium grill about 160 degree C until they meat is cooked throughout. Give each teen a plate with a freshly prepared hamburger and bun. Fill the table beforehand with beautifully laid out bowls of condiments, lettuce, cheese etc – and let them design their own burger. Be prepared: most will come back for seconds! Let the kids help make these easy pizzas it keeps them occupied and it helps you too, they could even make silly faces out of the toppings, why not have a scary pizza face competition? Mix the yeast, sugar and just 50ml of the lukewarm water and stir well. Next put the flour in a separate bowl and mix in the olive oil and salt. Add the yeast mix to the flour, oil and salt and pour in the remainder of the lukewarm water (200 ml). Using your hands mix it all together and then knead the mixture until you have a smooth dough. Cover the dough with a dry cloth while you make the sauce. You now need to preheat your oven to 240 degrees C.
The Sauce. Chop the onion and garlic and place in a pan with the olive oil. Stir in the rest of the ingredient and the tin of tomatoes and let it simmer for half an hour until it reduces down. Then blend the sauce and let it cool. Back to the base. 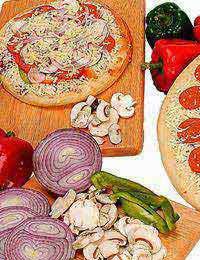 You now need to preheat your oven to 240 degrees C. Taking a 1/3 of the dough spread it out onto your pizza tray using a rolling pin, you may need to use your fingers to create the perfect pizza shape. Now all you need to do is chop up your chosen ingredients such as mozzarella, pepperoni, ham or whatever your hungry teens desire. Spread some your sauce onto the base (enough to cover the base, not to thick, remember this sauce is for 3 pizzas) and place your ingredients on top, cheese last. Then simply pop in the oven for approximately 18-20 minutes. Set the oven to 200 degrees, gas mark 6. Crush the garlic cloves and mix with the softened butter. Next slice diagonally into the bread, taking care not to slice all the way through the bread. Spread the garlic butter in between the slices and place on a baking tray in the centre of the oven for 10-12 minutes. Give each teen a bowl, a spoon and several scoops of ice cream and let them go wild!To keep the fun more or less contained, think up prizes for the most originally named dessert, such as Tangerine Dream Special, Chewy Chocolate Delight or Mocha Madness. Put fruit in blender with crushed ice until desired texture is reached, adding juice if needed. You can experiment with different flavours and add a dollop of ice cream for a richer consistency, if desired. Serve in tall glasses with paper parasols, swizzle sticks and slices of fruit. Hint: For a delicious variation, serve milkshakes as well as smoothies. All you need is ice cream, milk, some crushed ice and a bit of chocolate or strawberry sauce, according to taste. You can also add Smarties, chocolate chips, nuts or mint chocolate pieces to give each shake added flavour and texture.